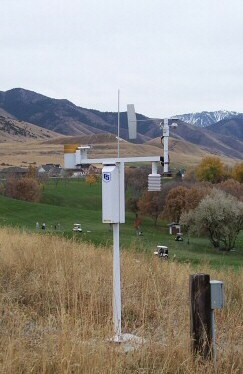 This ET106 weather station is located at Birch Creek Golf Club in Smithfield, Utah, USA, and is maintained by Campbell Scientific. Elevation at the site is approximately 4760 ft (1451 m). Birch Creek Golf Club is approximately 6 mi (10 km) north-notheast of Campbell Scientific and about 305 ft (93 m) higher in elevation. The Birch Creek Golf Club is located on the foothills of the Bear River Range on the east side of Cache Valley in northern Utah and has a climate similar to Logan. However, due to Birch Creek Golf Club's higher elevation foothill location and Campbell Scientific's lower elevation valley bottom location, some microclimate differences do exist.